Niagara-On-The-Lake, Ont. 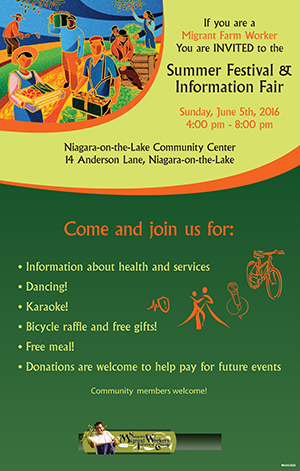 – May 30, 2016 – UFCW Canada and Agriculture Workers Alliance (AWA) activists are gearing up for the 8th Annual Migrant Farm Worker Summer Festival and Information Fair, to be held on Sunday, June 5 from 4pm to 8pm at the Niagara-On-The-Lake Community Centre. Organized by the AWA and the Niagara Migrant Workers Interest Group, the yearly event allows migrant farm workers labouring in Canada to access health services, legal counsel and support, and critical health and safety training, as well as important information regarding labour rights and English as a Second Language (ESL) courses. This year’s festival and fair will also include a free meal, karaoke, dancing, and a raffle draw for prizes donated by various community sponsors. All migrant workers and community members are welcome to attend. “Often facing extreme hardships, dangerous working conditions, and a lack of access to adequate health and transportation, agriculture workers continue to be denied the right to join a union in Ontario,” says Stan Raper, the National Coordinator for the AWA. “In the absence of union representation, events like the Migrant Farm Worker Festival and Information Fair are essential to providing migrant farm workers with vital services and training while they are working in Canada,” he adds. For over a decade, UFCW Canada has worked tirelessly with the AWA in the ongoing struggle to secure basic human rights for agriculture workers across Canada. The AWA has more than 12,000 members and operates multiple support centres where agriculture workers can gain access to free training, legal representation, and health and safety services.